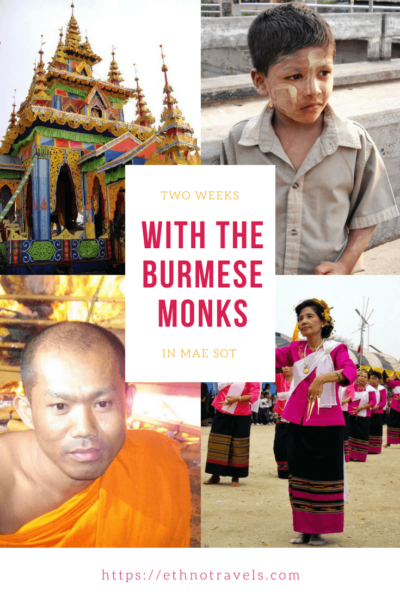 How I spent two weeks with a group of Burmese monks at the Burmese border in Thailand during a major funeral ceremony. In March 2009, I visited Thailand. After a week, I reached Mae Sot, at the Burmese border. I really wanted to discover the city before continuing further north along the Burmese border and the Moei River. My National Geographic indicated that the city was rarely visited and I wanted to see one of the many temples of Burmese inspiration. I was eager to get to the border market before taking this little-used road. Meeting Nyne Chang and a monk... drunk! I finish the road at the bottom of a crowded minibus. It is magnificent: houses on stilts, reserves and mountain villages; I am not in a hurry to arrive. The bus finally drops me on a square right in the center. Not easy to find your way without a map of the city and without knowing where the guesthouses are. While walking, I admire the beauty of the little Burmese kids. 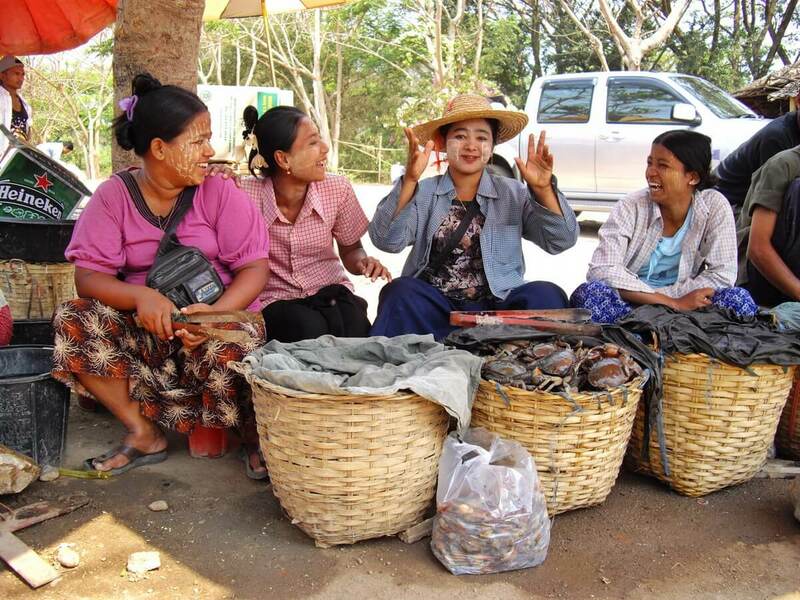 The city's population is made up of different ethnic groups: Thai, Burmese, Chinese, minority tribes like the Karen and Hmong live together in a relaxed atmosphere, despite the hardships they have had to endure. Some of them wear the traditional thanaka, a yellow powder, adding a touch of mystery to their beautiful faces. Little monks in bright orange robes laugh and play with their classmates in civilian clothes. I let myself be gently seduced by the nonchalant charm of this village and its welcoming population. In the evening, I make a detour through the paper temple, this time illuminated, before going to dinner. I find some of the children, who hasten to make demonstrations of sword fights in front of my objective. When I show them the pictures and videos I just took, their pleasure bursts out loud. I leave them to their game and settle down on a quiet terrace. I was quickly joined by a young Burmese man, who asked me to sit at his table and talk. His name is Ni and he tells me he lived in the United States for 20 years. Very quickly, I am annoyed by his attitude and his ideas. He is a follower of globalization and he claims he can lead the world better than anyone. According to him, tourists should behave abroad as at home, to teach their own customs... Taking advantage of an unfortunate word from him ("if we spend the night together" that I rectify by "the evening"), he stings me with one: "I don't care if you don't understand me anyway". To cut short and try to get rid of him, I pretend to want to go back to the paper temple. He proposes to accompany me on his scooter. When we arrive, everything is calm. The temple still shines as brightly as ever. Two monks are quietly sitting on chairs, enjoying the soft tropical heat and the song of the cicadas. The youngest one exchanges a few words in Burmese with Ni. He explains that they erected this temple for seven days and seven nights of festivities. He proposes that we return the next morning to see the body of the monk exposed for six years in the temple. I don't understand everything Ni translates for me, and I'm beginning to strongly doubt that he lived in the United States. Six years, six months? 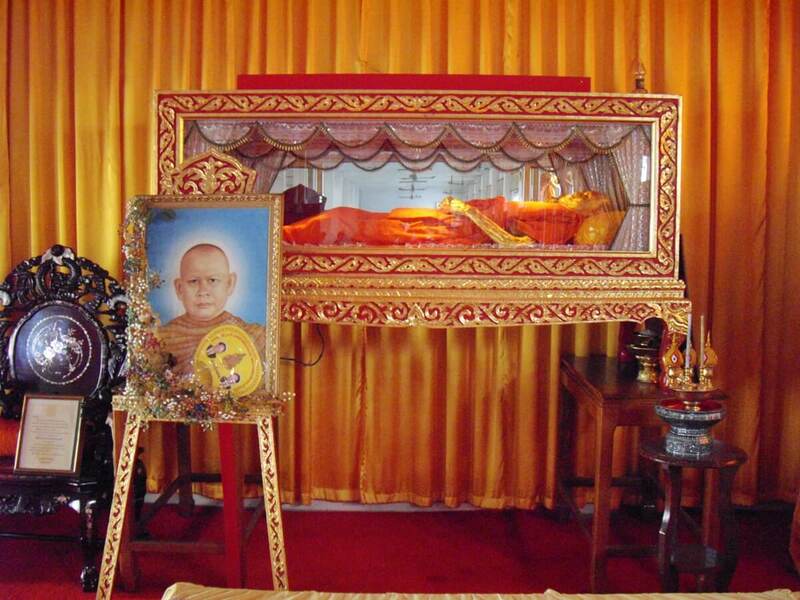 What does this dead monk have to do with these festivities? The young monk does not take his eyes off me, watching for the slightest of my reactions. He tries to explain it to me with a few words of English. He insists: "The hair of this monk continues to grow. It's exceptional and only because he was a leader." He smiles and the serenity and wisdom that inhabit him can be read in his gentle gaze. Suddenly, the other monk stands up and takes my camera. He wishes to photograph the illuminated temple, but he has difficulty stabilizing his movements: he is totally drunk!!! I don't like the way he looks at me and gets so close to me. Without giving up his smile, the young monk explains to Ni that the other monk wants to discuss face to face with me. I exclaim, "Why does he want to talk to me? He's a monk!" The young monk laughs while Ni tells me that the decision is mine. I refuse, we get back on the scooter and Ni exchange again some words with the monk, while putting his hand on my thigh. This boy has the talent to annoy me and a very strange way to seduce... He asked me to come back together the next day. I explain to him that I don't know what I'll do the next day and that we might meet at the temple. Now I'm definitely rid of him! 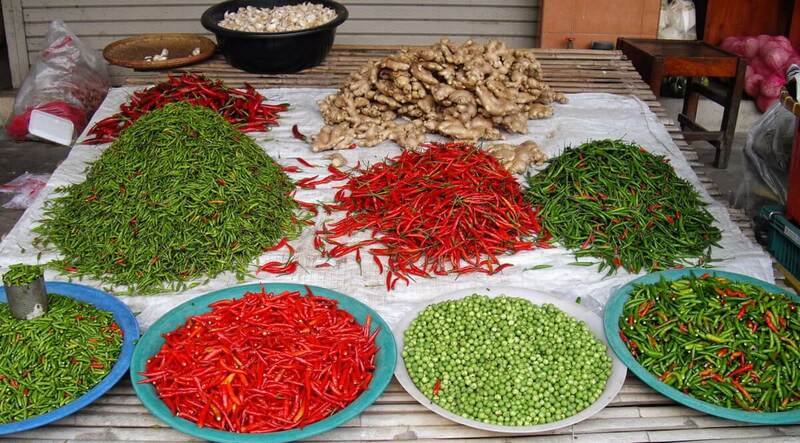 I go to the market to take a minibus for the Moei market, the border market a few kilometres from the city. Since I can't find the stop, I go to a shop. One of the customers offers to take me there in his vehicle. He is a patrol policeman from Bangkok, who is kindly driving me there. In front of me, the long Friendship Bridge leads to neighbouring Burma. I walk along the fence and find myself facing the Moei River, the "westernmost point". Burma being just across the Moei River, military and police patrol the market area. Unfortunately, the area is also known for its illegal trade and drug trafficking. I walk around the covered area, but the electronics, junk jewellery and stalls loaded with modern consumer goods make me forget the appeal of precious stones, carved woods and traditional clothes. Nothing attracts me in this part, so much I have the feeling that everything is counterfeited and eroded by galloping modernity. A little further on, I arrive at the traditional part of the market. The stalls are most often installed on the ground. The steps are replaced by large plastic bags filled with sand. The stalls are made up of everything that their owner was able to recover: plastic, scrap metal, wood, fabric. Here, the D system predominates. I immerse myself in the atmosphere, but I cannot take my eyes off it, the inaccessible... It looks so beautiful with its high mountains, pagodas, lush vegetation and traditional houses. Only the river separates us and I decide to follow it beyond the market. I'm watching it, trying to guess its secrets. I envy its inhabitants who come from there or return there, on a boat or a simple tire, exchanging goods from one border to another. It seems that the bridge is sometimes closed; but how could the border be hermetic when a simple tire is enough... I walk along bungalows on stilts, wooden walls and dead leaf roofs. Time here seems to have stopped. Some children play with fishing nets, others swim. It's so good to wander around! I climb into a songtaew, one of those group taxi vans. A child and his father follow in my footsteps. All the occupants seem under their charm, they are of a beauty and a breathtaking softness. I only dare to photograph the boy, radiant that one finds him so beautiful. I decide to return to the temple of the previous day and see the sympathetic young monk again. He leads me to the room in which the deceased monk lies and confirms that I understood correctly: he had died six years ago and his body had been kept in a glass box awaiting this funeral ceremony. "Her hair keep growing, it's exceptional you know." The body has been brushed with gold paint to hide the beginning of decomposition. My guide invites me to take a picture: "no problem, go go go!" I can't refuse at his smiling insistence. He is obviously very proud to show me his culture and looks forward to the start of the festivities. "Come tomorrow, we'll put the body in the paper temple and pray." I wouldn't miss it under any circumstances! I let myself be invaded again by the nonchalant atmosphere of the city, and finish the day by taking advantage of my pretty terrace and by visiting the temples of the city. 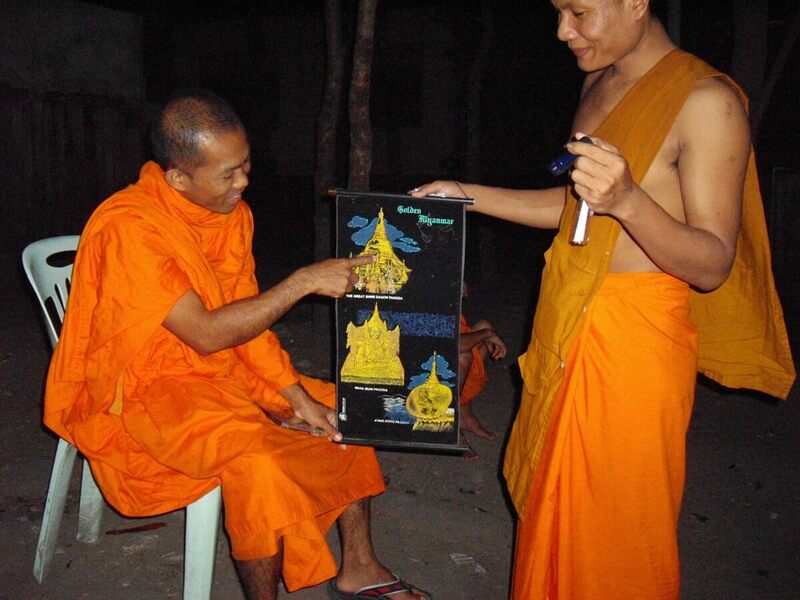 In some, orange has given way to saffron, the colour of Burmese monks' dresses. I enjoy the spectacle of young Burmese draped in batik, making offerings and praying to Buddha statues. The city is full of temples and sanctuaries nicely maintained and decorated, and I can't resist the urge to photograph everything. Then in the evening it drapes itself in a pretty colourful dress, and it is precisely the kitsch of its lights and its monuments which gives as much charm to certain Thai landscapes. The next day, I go directly to the temple. I arrive there at the end of the first prayer. Tables have been set up everywhere, and everyone sits down to share a hearty breakfast. The women brought back beautiful silver containers, which contained the various dishes they had prepared for everyone. I attend, sometimes amused, the last preparations. Seeing that I am taking pictures, an inactive monk takes the place of a child looking nonchalant, and begins to pose for my photo. The presence of the only tourist did not go unnoticed, and an old man brings me ice cream with a little brioche. Rice seems to have fallen in. I try: what a surprise, I taste a delicious rice ice cream! It's time to go back to prayer. Men and women sit on separate carpets inside the main temple room, while others sit on chairs or benches outside. The monks are seated on their wooden armchairs, behind which are raised some kind of fan. They are in fact rewards given by the King on the occasion of their ascension in the monastic hierarchy. Some sing litanies, while others take advantage to... send SMS!!!! A group of lay people get up to prepare the flowers that will be thrown on the chariot. The monks gather one last time in front of the body, then it is time to take it out of the temple. The monks lift and hoist the box on the chariot. A long white cloth is attached. The laity set up for the procession, each holding a piece of cloth. The monks stand in front of them, and a group of old men lead the march. The exit is made through the main enclosure of the temple. They make the tour, before heading towards the paper temple. 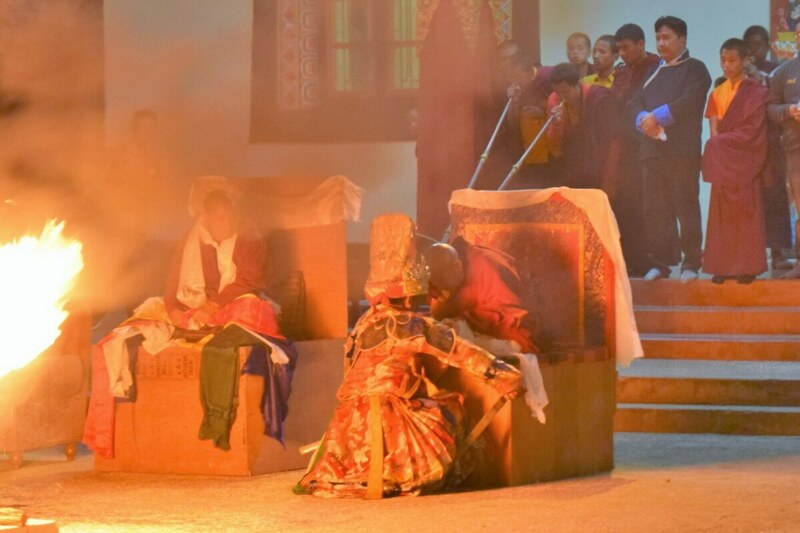 The monks put the box inside, and most leave, leaving room for the women in ceremonial dress. They are in fact dancers, honouring their former leader. His importance lies in the fact that he remained a monk for 34 years, after having left his wife and children at 29. Some women bring me food they have prepared. I eat and drink with anxiety for my stomach and a little reluctantly, a salad of cold cabbage, smoked fish and sesame, drizzled with a glass of iced ginseng. As I'm leaving, I'm called by a "Hey, you!". It is the young monk, who makes me visit the various attractions: the fair, the Thai boxing ring, the dance podium, the stage of the dance show... All within the temple enclosure! In the evening, I decide to attend the Burmese dance show organized at the temple. It's a long wait, and the figurants offer me a place backstage. Fortunately I decline their invitation: whereas I expect a traditional show, men and women in strange coloured dresses gesticulate in all directions; then comes the turn of the singers, who follow one another, and to whom the public brings roses. It's decided: if a third singer arrives, I run away! I go around the different attractions. There are many people everywhere, and lots of small stands of food, drinks and souvenirs. On the side of the boxing stand, monks attend the show. A few meters away, the dance podium spits out its decibels while young girls in mini-skirts and ample necklines shake in a very suggestive way. Yes, we are in a temple, welcome to Thailand! Once again, as I am about to return, I meet the young monk and his friends. We watch the burlesque show while chatting. I follow the little group of monks in orange dresses. We head towards the second courtyard of the temple and they enter a monk cell. I dare not follow them, I am a woman, they are monks... "Take off your shoes and come in, sit on the rug." The moment seems totally surreal to me! My improvised guide is called Nyne Chang, and he's Burmese. For the Thais, he adopted the first name of a former Thai King, U Thong. We talk and write for hours. Nyne Chang and his friends are very curious about my travels and keep asking me questions about China, the Chinese monks and Tibetan Lamas. In exchange, they tell me about their country, Burma, which they love despite the political problems, their religion and their beliefs. Nyne Chang proudly shows me his saffron dresses "it's very expensive these fabrics you know, much more than orange dresses". How lucky I was to meet them and to be accepted with such kindness! At 7 o'clock, I go to the market. I hope to be able to take some pretty pictures of life scenes and traditional clothes. The stalls explode in colors: the green of Florida turtles to taste, the ochres of spices, the green and red of fresh vegetables, the yellow and orange of fruits, offering collars, flowers, meat, fish of all shapes, fresh or dried, toad fillets, original Thai brooms... Women dressed in colourful batiks carry heavy loads on their heads, while monks in orange or brown robes and nuns in light pink robes beg for food or walk under their brown parasols. I walk for a long time, before going to the temple to greet Nyne Chang. He is surprised to see me leave on the second day of the festivities: "it's a pity, you won't be there for the cremation, it's a great interesting event". I have no doubt about it and, even if I appreciate the originality of discovering this unknown culture by discussing with these monks, I have toured this small border town and the funeral ceremony is only in 6 days. I sit on the left side of an orange van (200 baths, or about 4€): a young man told me about a village a few miles away, which I should not miss. My first stop, Mae Sariang, is seven hours away. The mountain road runs along the Burmese border, through a landscape that has retained all its authenticity. The village houses are made of thin planks of wood, reed stems and their roofs are made of dried leaves. Pagodas are lost in the wilderness. Our songtaew keeps stopping in the middle of nowhere to embark or disembark its passengers, most of whom are dressed in traditional clothing. We stop in a village that contrasts with those of the tribes we have passed so far. Rich homes are made of varnished teak wood and private gardens are filled with flowers. 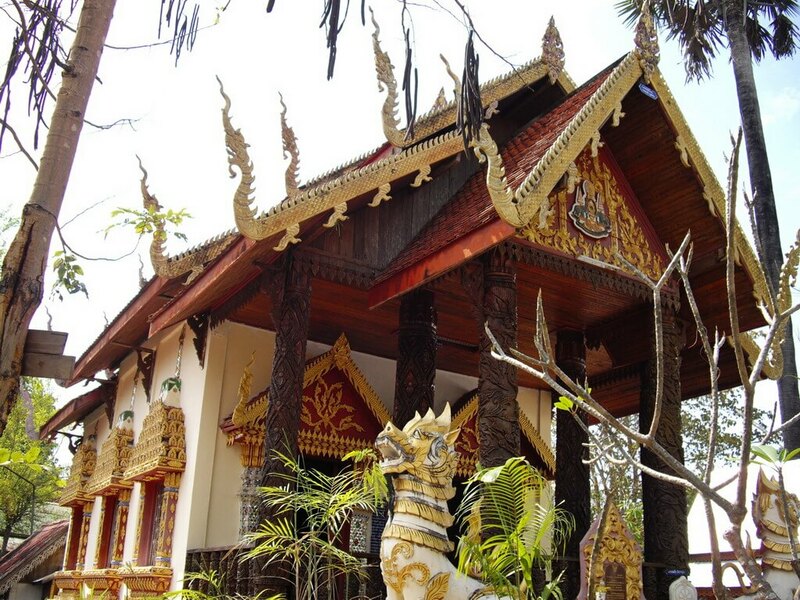 Here, the road is paved, but Thai and Burmese flags continue to adorn the houses. If we stop here, it's because we have a flat tire, and I take this opportunity to stretch my legs, while taking some pictures. Our van keeps filling up. Soon, young people are standing on the backstep, and others are squatting in the middle of us. Our driver keeps stopping everywhere, negotiating some purchases at the roadside, or simply chatting quietly. Some passengers watch my reactions and have a lot of fun watching me get off at a stop to relieve the pain... of my buttocks! After seven hours of permanent show, I am the last to be dropped off at Mae Sariang bus station. I move into the River House, a teak building with balconies overlooking the Salawin River and the forest. Even if the place does not lack charm, I am surprised to pay the same price there as for my pretty bungalow of Mae Sot. I'm invited by some Swiss people to share a beer. One of them lives in Chiang Mai, and makes discover the area by motorbike to his friends. He advised me to continue the next day to Mae Hong Son, Mae Sariang having little interest according to him. The gloomy weather made me follow his advice, and I made my decision: there are buses between Chiang Mai and Mae Sot. I really want to go to the cremation and see Nyne Chang and his friends again. After a few days in Mae Hong Son and Chiang Mai, here I am back in Mae Sot and Ban Thai guesthouse. As soon as I get installed, I can't wait to return to the temple and see its Burmese monks. Nyne Chang welcomes me with a big laugh, he is obviously as happy as I am to see me again and to be able to resume our discussions on the culture of our two countries. He proudly shows me the computer he was able to acquire thanks to his savings and the money I had given him before I left. Sometimes, other monks enter his cell, exchange a few words with him looking at me strangely, then come out. I feel a certain unease floating and I question Nyne Chang, is there a problem because I am there? "Don't worry, no problem." We spend two hours of intense discussion before my dinner at Casa Mia, I'm already back to my habits! The temple is more and more animated. The devotees from all over the region arrived to pay a final tribute to their former leader and attend the funeral ceremony the following evening. I spend a little time in the cybercafé near the Ban Thai before going back to immerse myself in the festive atmosphere, over-excited, and full of fervor. As I prepare to return home, Nyne Chang calls me. He makes me wait while he finishes his telephone conversation with his sister who lives in Bangkok, then we attend a part of the Burmese dance show. The kitsch singers have given way to humorous acrobats, in fact sort of Burmese clowns with no red noses and strange outfits, making impressive stunts. After a while, we join one of Nyne Chang's friends in the monk's cell. 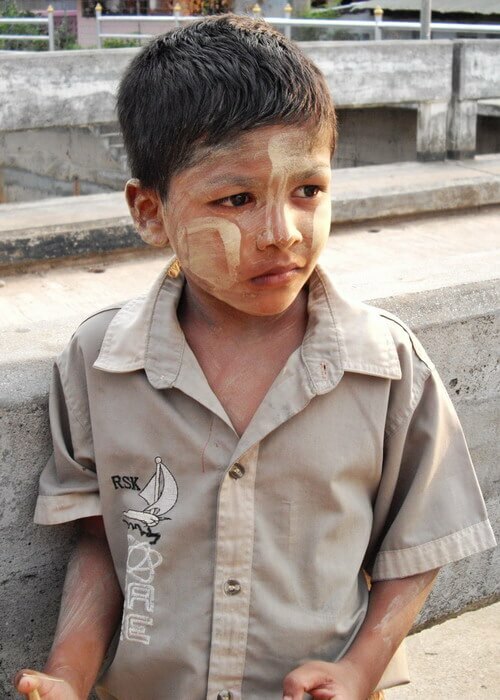 He is Burmese and lives in Myawaddy, the town across the Moei River on the Burmese side. Nyne Chang and the others make fun of him. They explain to me that he is terrified at the idea of going out, including around the temple: "it's very dangerous here you know" he tells me while the others burst out laughing. I soon laugh with them as I hear all his questions and astonishments in approximate English: "Wow, you're so big!" (you're so old) shouts he when I tell him my age; "Why are you so small? European people are very high and big normally" (why are you so little? Europeans are very large and fat normally). Nyne Chang, often hilarious, listens attentively to my answers and does not ask any personal questions, keeping the distance fitting to his status as a monk. The day that everyone was looking for has finally arrived, tonight the cremation will take place. For this last day, I put on my batik from Indonesia as my ceremonial dress. I start by going to the market, hoping to find a Burmese or Thai dictionary or phrasebook to communicate more easily with my new friend. I normally always take one with me, but this time I decided too late on my destination and none was available in France. Unfortunately, I only find introductory books on foreign languages for Burmese or Thai. Never mind, we will continue to communicate in English or in writing! After a brief passage to the temple where I find Nyne Chang very busy with the last preparations, I decide to walk along the river. I stop for a long time at the small temple that a Burmese nun takes care of. A group of men and women invite me to discuss with them. Around noon I return to Wat Aran Ya Khet, the temple of Nyne Chang and cremation. He then invites me to join the others in the inner courtyard of the temple for dinner. Some old ladies first offer me spicy crab salad. I'm not in the habit of being difficult, but it would probably have been delicious... if the whole crab hadn't been crushed, including the shell! As they emphasize about the spices, inviting me not to finish my plate, I take this opportunity not to eat my dish. Then they offer me chicken and coconut noodles, then a bowl of a strange dessert that is a real delight with its sweetened condensed milk and coconut taste. I spend a large part of the afternoon in the temple, admiring the fervour of the devotees. The banknote trees are more and more leafy, and the wires stretched towards the paper temple will soon no longer have room to receive the last banknotes. I ask Nyne Chang: "Will they burn the money with the monk?" He laughs, the money is for the temple. The old man who gave me the rice ice cream at the beginning of the festivities invites me to pray in front of the deceased monk. It's hard to walk away even though I know all eyes will be on my clumsy gestures. I observe one last time the gestures of my predecessors then I plunge into the company of a family, I naively hope to go unnoticed ! Although I have already made a donation for the temple, I decide to make another one and hang a note on one of the wires. Everybody's looking at me, trying to see the color of the note I'm stapling. The monk holding the microphone today is asking the old man. He asks me the amount of my ticket and the monk triumphantly continues "100 baths, thank you" while I don't know where to hide. Then comes the time to prepare the pyre. The devotees take turns filling sand buckets and pouring them into the paper temple. The monks are installed under the tents and bless the followers while receiving their offerings. I help with their distribution for a while, before going to one of the restaurants in the centre for dinner. On the menu, catfish and fruit juice with banana, mango, pineapple and tamarind. The time for cremation is finally here. The security service takes all the furniture, precious objects and flowers out of the temple. The monks pray one last time and then take the body out of the box and place it on the litter box. Nyne Chang invites me up to the stage, but the security service forbids me to enter. I leave my camera with my friend. He has a front row seat to photograph the lighting of the pyre. As the blaze gets more intense, I'm allowed to join him. He tells me how happy people are. This cremation is extremely important because the deceased monk will now be able to answer the prayers they made while recollecting. Turns out mine will come true some time after I returned home. Tomorrow, once the whole body will be consumed, the ashes will be placed in an urn and placed in one of the temple buildings. Not all monks have this privilege, most of them being buried. I notice the presenter's presence and understand his white outfit: he is in charge of maintaining the blaze with a stream of water. I spend a long time soaking up the atmosphere before joining Nyne Chang and one of his friends. I sit a little aside. It is not appropriate for a woman to sit in a chair in the same room or near a monk. My friend seems to have a special aura, of which I am not surprised, among the devotees. Many of them come to him to discuss, seek his advice, be blessed, and bow down before him. He shows great gentleness and solicitude with each of them. Another group on the sidelines attracts no faithful. 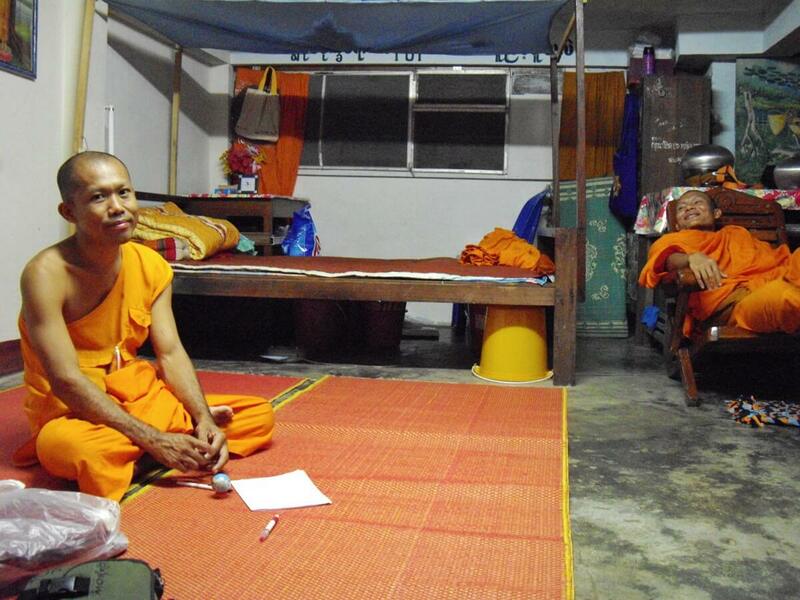 It is a group of Thai monks with a particularly antipathic approach. Among them is the drunk monk of the first night. I find his look particularly nasty, and his attitude towards me just as bad. Who looks alike comes together... A kind of African marabout with a particularly shady look spends a large part of his time with him. This one avoids me since he knows that I am French and systematically avoids the lens of my camera, but Nyne Chang absolutely wants a picture of him and I execute myself. The night is well advanced and it is time for the monks to begin to clean up; at least the bravest among them as my friend! The next day, Nyne Chang takes a few hours of well-deserved rest in his native country. He asked me to come but I didn't dare following him, thinking stupidly that it is not so easy to get a visa for the other side of the border. 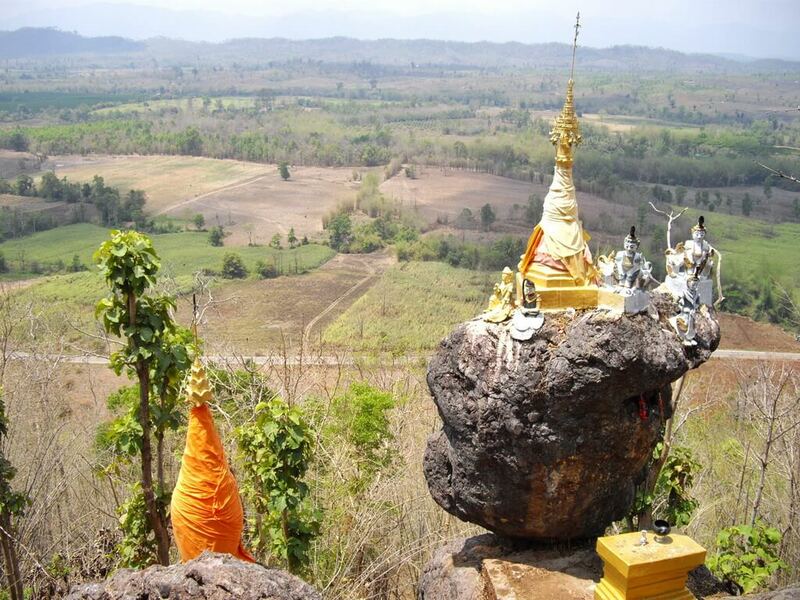 I decide to use the services of a biker to go to Wat Doi Din Ti, a superb temple perched on a rock, that a hermit built alone and that Fabrizio, an Italian met on the bus for Mae Hong Son, had also recommended me. After having crossed a peaceful village made of bamboo houses and dried leaves, we arrive at the foot of a long staircase flanked by large nagas. Higher up, a standing Buddha seems to guide visitors. After a difficult climb because of the heat, I arrive at a first sanctuary dug in the rock. Inside, a serene Buddha taking the earth to witness lies on an altar invaded with statuettes, photographs and ceremonial objects. The monk sits on a platform outside, in a meditative posture. I continue my hard ascent towards a rock in balance surmounted by a stupa. One wonders how a solitary monk could have done such a work in such a place. From there, one dominates all the plain and one sees Burma in the distance. Nearby, large bronze statues of the Buddha peacefully await the rare visitors, while the stupas are surrounded by a profusion of decorations. I go down again after a long time to discover the houses on stilts of the neighbourhoods. Back in town, I discover the monks dismantling the paper temple. It will take them several days of work. Nyne Chang introduces me to a friend of his who returns to civilian life in the greatest indifference. He simply enters Nyne Chang's cell and leaves with his old civilian clothes. I'm having a long talk with my friend. He has been a monk for almost 5 years, although he only thought he would stay a few months. Despite its application in religious practice, this choice was initially dictated by the interest of free access to medicines. He is indeed very sick having worked in ruby mines for 5 years. He left under constraint, his back having been severely deformed by carrying heavy loads. He even found himself totally paralyzed, unable to move, eat or sleep. His only desire was to die. Little by little, he was able to regain his mobility, first with a stick, but the repercussions on his heart and stomach will never disappear. He would like to return to his home province but refuses to let his mother and sister know about his health problems. Until he has enough money to care for himself and his family, he will not return, despite the daily cries he hears on the phone. He tells me his life with a smile, and I better understand the deep respect that most people show him. He gradually reveals himself, and ends up confessing to me the remarks that his master made to him about me. Burmese and Thai traditions being very different, Nyne Chang finds my visits normal. In Burma, women come to flower and put incense in the cells. They can sit on the ground when the monks are sitting in chairs, the only rule being to keep the door open and its distances. 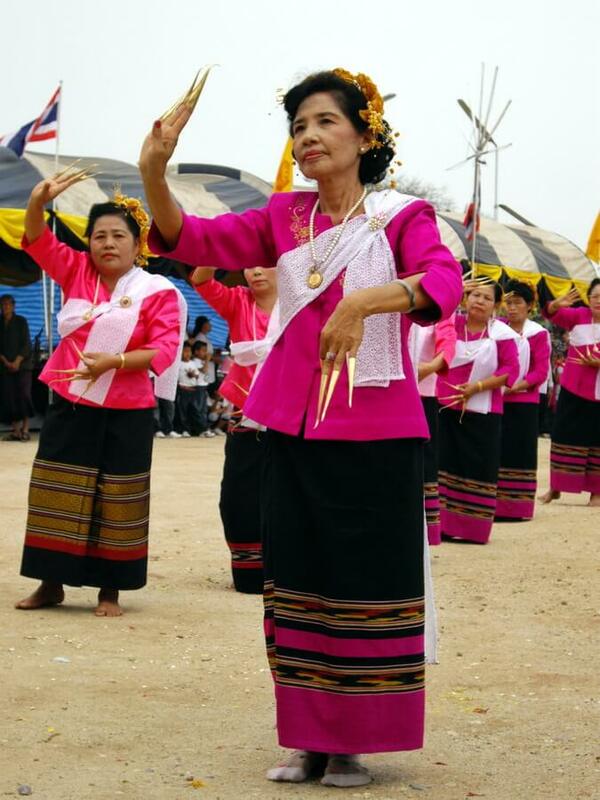 In Thailand, a woman's presence is seen with a very bad eye, especially if she is from another culture. Thai monks are often of doubtful exemplarity and prefer to accuse their foreign counterparts of all evils, especially since they generally do not speak English and are therefore very suspicious... The monk from Umphang who was with my friend when we met is a perfect illustration of this. Not only did he try to flirt with me clumsily every time we met, but he was also violent with the other monks and often drunk at night! As I stop by to say goodbye to my friend and head south, he convinces me to spend more time in the area to discover the surrounding temples. I don't have to be begged, enjoying learning in such unusual company. As a woman I never thought I would be welcomed like this by monks and I am in no hurry to put an end to those moments that I will never forget. Nyne Chang calls his buddy from the night before. Now that he is no longer a monk, we can freely rent a scooter and discover the surroundings together. 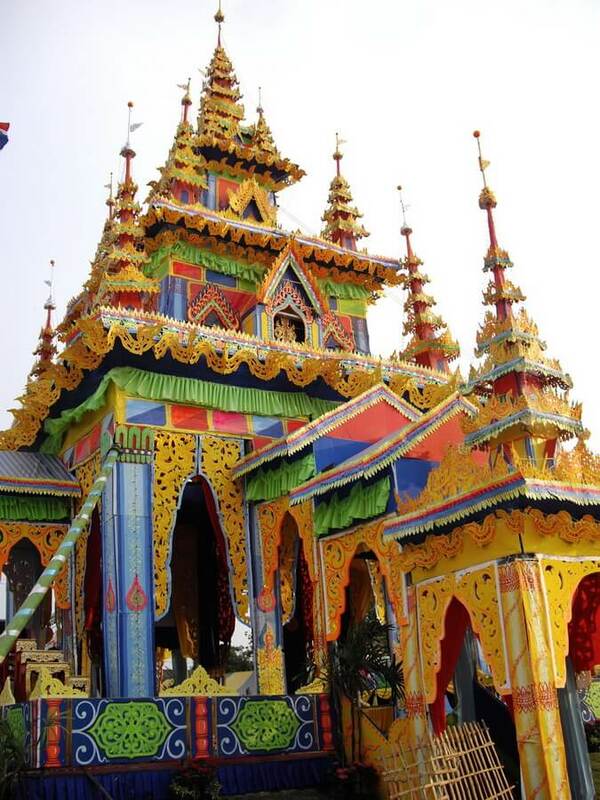 We visit a first Burmese temple. Their particularity, unlike those of Thailand, is that the whole enclosure is sacred, even the outside. So we have to move barefoot. The most important part is also forbidden to women; it is the platform where the deities lie and where the monks officiate. We visit the first floor, with walls covered with shiny mosaics and decorated with many statues of Buddha in gold and marble. One of them is 60 years old, and the oldest is 150. An old monk gives us his blessing and offers us a prayer necklace, always made of 108 wooden beads, a sacred figure for Asians but also for many civilizations. 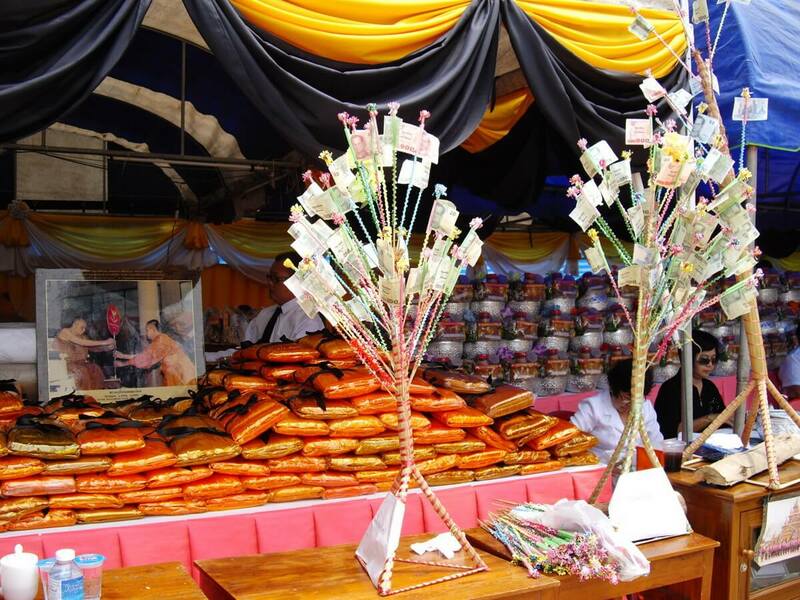 We make a detour through a Chinese temple and the Moei Market before heading to Mae Ramat to visit Wat Don Kaew. The village is surrounded by mountains. The beautiful wooden houses are flowered and the streets are impeccably clean. A monkey welcomes visitors to the temple. He's used to the man and lets me touch his hands without any fear. A little further on, the monks dig the ground to uncover ancient remains. The place is really peaceful and we spend a long time talking with the elder. On the way back, the heat is favourable to a refreshing stop at the edge of the river. While children bathe in muddy water, adults are comfortably seated under bamboo constructions. Our last stop will make me particularly uncomfortable. The next day, I desperately wait for Nyne Chang's friend. The night before, I had had the greatest difficulty getting rid of him after the Thai fondue restaurant, and his attitude when leaving had worried me a little. "Do you really think you'll leave tomorrow? ", he had struck me with a strange smile. I join Nyne Chang after the prayer; he too is worried but tries to reassure me. His friend leaves his phone ringing without answering. Eventually, he will cut it. We decide to go to his parents' house. Nobody knows where he spent the night. I explain to Nyne Chang that he had tried to install himself in my bungalow by pretexting the closing of the lower floor of his house. Nyne Chang is furious at this attitude. Both come from the Burmese state of Arakan. It is a real pride for my friend and someone who comes from it is supposed to behave with dignity. Although calm on the surface, I can feel that he is getting more and more angry. We find the rental store and explain the situation. The answer is clear: no scooter, no passport. As I begin the discussion with the police, my phone rings. I pick up the phone and hear a loud laugh. This is too much for me. I give the phone to Nyne Chang: "talk to that idiot, because now I'm really going to get mad". My friend's tone gets cold and authoritarian; he is really very angry: the scooter must be brought back immediately and he never wants to meet his old friend again. "He's from Arakan, I'm so sorry. I think he drank all night long. ", does he spend his time saying. "Arakan people are not like that. We are good people." While my friend has done everything to help me solve the problem, he feels only shame and sadness for the Arakan. An emotional morning... and I missed my bus again! I stayed a few more days in Mae Sot to enjoy the presence of Nyne Chang and his friends. I took him to see his comrades from the temple where he lived before Mae Sot. As we walked quietly to reach the road and find a mode of transportation, I asked him about the barrier at the entrance of the village. He told me quietly that it is a village of Burmese insurgents and that they are forbidden to go out at night. Over the days, I was able to meet other Burmese monks. At first very distant and strict towards me, their attitude evolved into a frank camaraderie where certain monastic rules no longer needed to be applied. Pyna Wan Tha, Nyne Chang's closest monk friend, had a real passion for watching me eat the food he received as an offering. Every time we saw each other, he always had a little sweetness for me and absolutely wanted me to eat it immediately. The night I left, he gave me a macrame bracelet that he blessed and then slipped on my wrist. 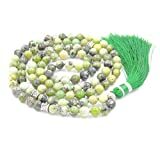 He then took out his most precious and expensive possession, a magnificent prayer mala made of jade stones. After a long prayer, he offered it to me both to protect me and as a token of his affection. I put it around my neck and promised to always keep it with me. I met Nyne Chang in March 2009 but I will never forget him. What was your most memorable travel experience? Have you ever attended an important funeral ceremony or other interesting traditional celebration? Come and tell us about it in the comments! 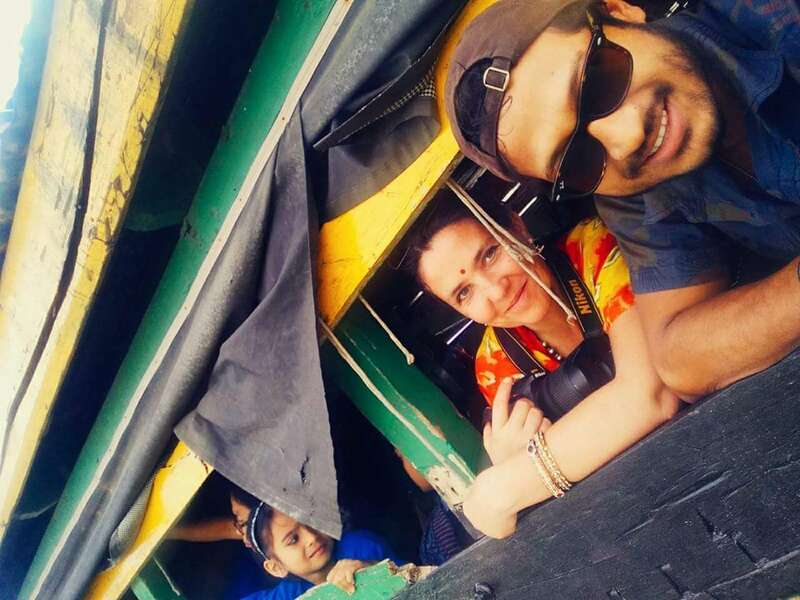 For tips on how to make such beautiful encounters while travelling safely, read my article on prejudices related to women travelling alone. You will find anecdotes punctuated with many tips to get out of all situations easily. Don't forget to subscribe to the newsletter using the form below. You will be informed as soon as a new article is published and will receive further travel tips. For more anecdotes, check my travel anecdotes section. You can change your mind at any time by clicking the unsubscribe link in the footer of any email you receive from us, or by contacting us at stephanie@ethnotravels.com. We will treat your information with respect. For more information about our privacy practices please visit our website. By clicking below, you agree that we may process your information in accordance with these terms. This article can contain compensated links.